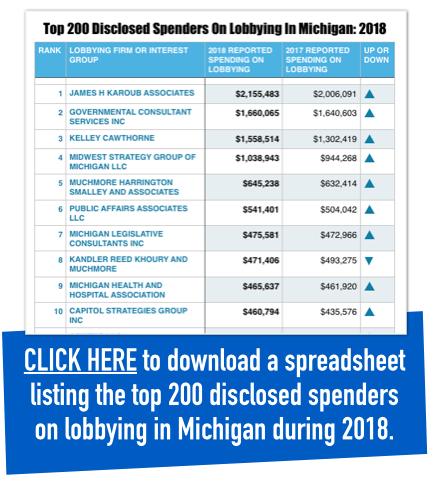 Lobbyists Reported Spending A Record Amount In Michigan In 2018. Their Rate Of Spending Increased Over The Last Five Months Of The Year, Which Included The Busy Lame-Duck Session. LANSING (Feb. 27, 2019) — At times, the halls outside the Michigan House and Senate chambers were as crowded with lobbyists as the agendas inside were with bills. It was lame duck 2018. As lawmakers sent nearly 400 bills to then-Gov. 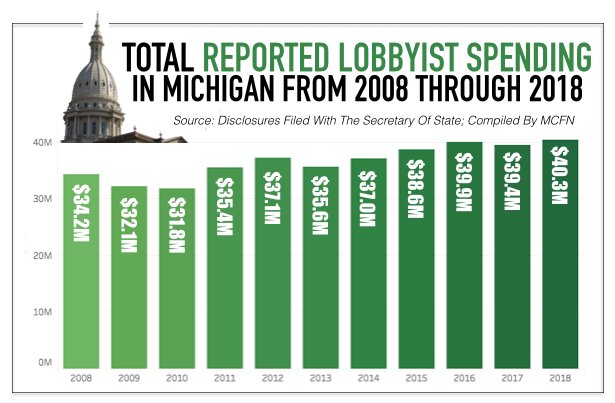 Rick Snyder’s desk in the closing weeks of the year, lobbyists upped their efforts in Lansing to influence policy decisions, helping to make 2018 a record year for lobbyist spending, according to state disclosures. Lobbyists in Michigan have to file spending disclosures twice a year. Their first disclosure covers the first seven months of the year. Their second disclosure covers the last five months. Over the first seven months of 2018, 2018 ranked third for total lobbyist spending. Then came the lame-duck session. Over the last five months of the year, 2018 moved from third to first for total lobbyist spending, ending with $40.3 million in overall disclosed spending. Lobbyists reported spending about $18.7 million over the last five months of the year — about $500,000 more than was reported over the last five months of any previous year. Over the first seven months of 2018, lobbyists averaged spending about $3.0 million per month. Over the last five months, their average spending jumped to $3.7 million per month. The disclosure requirements make it difficult to draw direct connections between the spending over the final five months of the year and bills that advanced in lame duck — the period after the Nov. 6 election and before newly-elected lawmakers took office. However, a variety of sources that work in and around the Capitol identified the reason for the jump in spending to be the Legislature's heavy workload in lame duck. Like others, former Rep. Gary Glenn, a Republican from Williams Township, who was a member of the House during lame duck 2018, said he didn’t notice an increase in lobbyist activity. But he said if the Legislature was addressing an increased number of bills, there was a reason for more organizations to become interested in the outcomes. According to Gongwer News Service, which covers the Michigan Legislature, lawmakers sent 398 bills to then-Gov. Rick Snyder in lame duck. He signed 342 of them, and he vetoed 56 of them, Gongwer has reported. There were more bills sent to the governor in lame duck 2018 than lawmakers sent over the rest of 2018. Bills approved by the Legislature in lame duck covered a wide array of topics, including changing the state’s minimum wage law, overhauling environmental regulations and altering state laws for the gaming industry. Among the nearly 400 bills were proposals that would impact numerous businesses and interest groups. In addition, lame duck 2018 was the final opportunity for groups to get bills through a completely one party-controlled state government. In 2019, a Democratic governor took office, breaking up GOP control and leading to divided government. These factors helped lead to often crowded lobbies outside the Michigan House and Senate. In the spaces outside the chambers, constituents and registered lobbyists often wait to meet with lawmakers and monitor what’s going on inside. 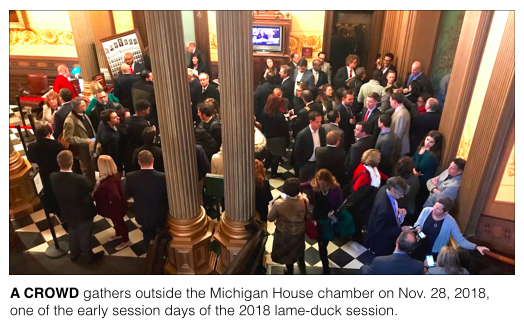 The group Progress Michigan and other progressive organizations, which opposed many of the policies that advanced in lame duck, worked to document what was happening in the lobbies during lame duck. The groups met with lawmakers and used video cameras. The goal was to give the public a “raw, unfiltered glimpse” at “the circus that was lame duck,” said Sam Inglot, a spokesperson for Progress Michigan. Some of the groups that increased their spending in 2018 were directly interested in bills that advanced at the end of the year. For instance, Enbridge, the company that owns an oil pipeline in the Straits of Mackinac, reported spending $47,775 on lobbying in 2017. In 2018, Enbridge reported spending $86,733. Amid calls from some lawmakers to shut down the pipeline, the Legislature approved a bill in lame duck to create a new authority to oversee a tunnel to house Line 5 into the future. Enbridge supported the bill. Snyder signed it into law. The casino MGM Grand Detroit reported spending $212,510 on lobbying in 2017. In 2018, it reported spending $388,370. The Legislature approved a wide-ranging package of bills on gaming regulations in lame duck. The package expanded online gaming and eased other regulations on casinos. The bills had the support of the gaming industry and a bipartisan group of lawmakers. But they ultimately received a veto from Snyder. 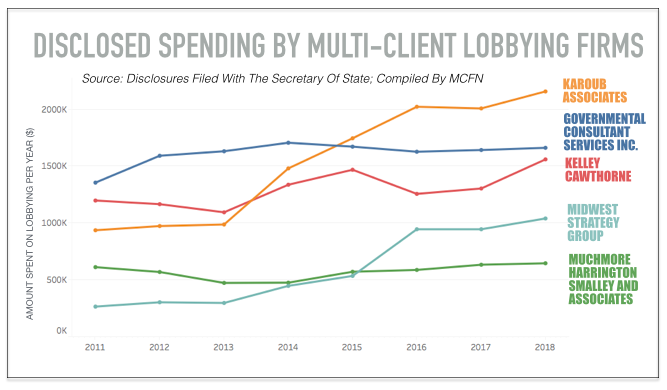 While there were individual businesses interested in policies that upped their spending in 2018, the spending of multi-client lobbying firms that represent various interest groups also trended upward. The five multi-client firms that spent the most in 2018 combined to spend $7.0 million. Those five firms’ previous high for a year was $6.5 million. Taylor Benavente, association industry advocate for Michigan Society of Association Executives, said while it’s not the case for all associations, some associations have outsourced their legislative functions to lobbying firms or management services. “The costs associated with these services are reflected in the sector’s trend of increased spending in this area,” he added. The overall lobbying total for 2018 of $40.3 million is up about $400,000 — or about 1 percent — over the previous record of $39.9 million in 2016. Total reported lobbyist spending has been generally trending upward for decades. In 2008, for instance, lobbyists reported spending only $32.1 million. The 2018 total is up 25 percent from the 2008 total.